You never get the chance to make a second first impression. While a school website may have once been a source of static information merely used for marketing purposes, it is now becoming integral to every school’s daily operation. Sharing information with families and the community. Office staff and teachers can avoid fielding repetitive phone calls and emails asking about upcoming events and school policies etc. Promoting the school to prospective families. You can showcase what makes your school special and encourage future enrollments. Providing an online hub. 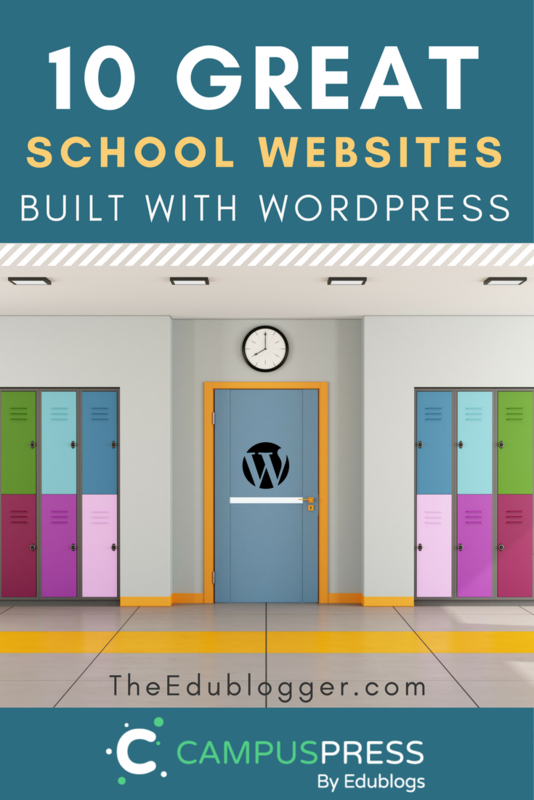 Your website can be your school’s virtual home that links to all your other online spaces such as social media accounts and learning management systems. It can also include platforms where educators, students and even families or community members can share their work, information and ideas. The lines between blogs and websites are blurring and merging. Offering the potential for collaboration. Schools can benefit greatly from collaboration, whether it is sharing units of work with teachers down the road, or collaborating globally on class projects. Having an online space via a school website is essential to be found and contactable. It can also provide an online home for your collaborations. 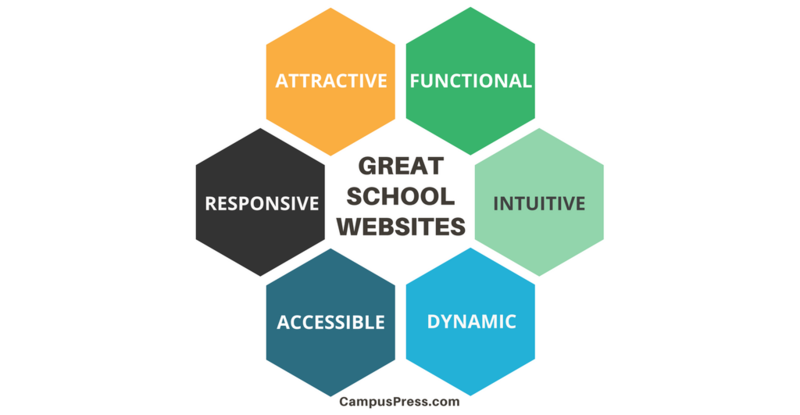 What Makes A Great School Website? It is becomingly increasingly rare for schools to not have a website at all. The biggest variable is often now the quality of the website and how dynamic it is. You want your school website to reflect and showcase your school’s strengths while enhancing the teaching and learning process. Attractive: First impressions count. 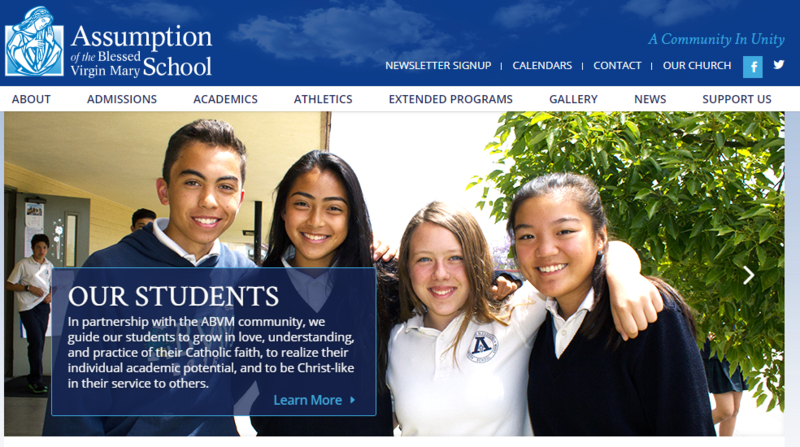 Is your website visually appealing and a clear representation of your school? Functional: How easy is it for users to navigate the website, find what they’re looking for and interact as necessary? You want the user experience to be good on both mobile devices and desktop computers. Accessible: A previously overlooked concept, it is now considered essential to make sure your website is accessible to all users, including those with disabilities. Dynamic: How is your website moving beyond the static space of old? What measures are put in place to ensure it is updated regularly? How is the website a hub for not just information, but interaction and publication by multiple authors? In an effort to inspire you with what’s possible when designing a school website, we are showcasing 10 great school websites built with WordPress. By far the most popular content management system out there, WordPress powers over 27% of the web. Yep, you read that right. More than a quarter of websites worldwide are built with WordPress. WordPress is behind everything from Vogue to Mercedes Benz, The New York Times, Sony and Time magazine. And of course, Edublogs! So why wouldn’t you want your school website joining these lofty ranks? The popularity of WordPress means that there is a huge worldwide community that contributes to the growth and ongoing improvement of the platform. One reason people love WordPress is that it is highly customizable, yet it is easy to use. You really don’t need to be too tech savvy to contribute to a WordPress site. The other good news is you don’t need to do any of the design or technical work in setting up or hosting your school website. Our highly skilled team at CampusPress can create and customize a school website that meets your precise needs. Onto our showcase of ten inspiring school websites. These represent just a tiny fraction of the high quality school websites out there, so we encourage you to leave a comment with your contributions! The website of this private girls’ high school based in Melbourne, Australia, certainly makes a powerful first impression. Visitors get an instant insight into the school through high quality sliding photography. Without even reading any of the content on the site, you start to understand what facilities and activities this school can offer. The homepage design is clutter free, primarily inviting you to either book a tour or use the menu to find further information. Scrolling further down the page you are directed to important information about the school’s philosophies while being presented with the latest news from school blogs. The Round Rock Independent School District in Texas, USA, has an impressive collection of school websites. For ease of use and consistency, they have a set-up where all their school websites are a similar design, yet are customized to reflect the individuality of each school. 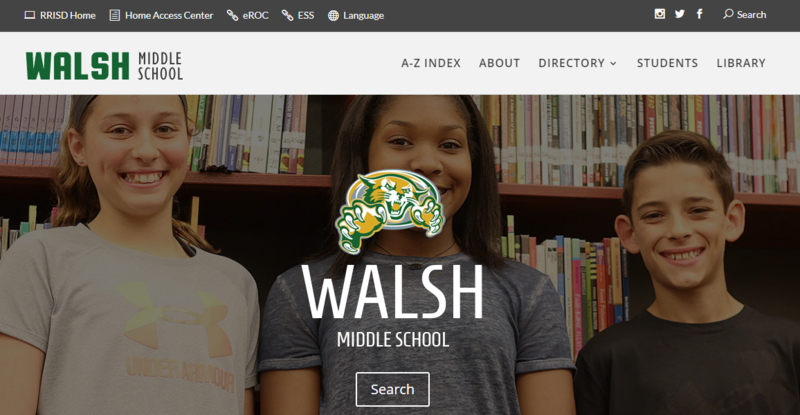 One example of this format from the Round Rock District is Walsh Middle School. The clear formatting ensures visitors know exactly where to search or browse for the information they’re after. The addition of a Google calendar makes it easy for schools and families to have a shared understanding of what’s happening on a daily basis. An impressive feature is the addition of a school news report presented by students and embedded on the homepage. This network of 13 schools is based in the San Diego area of California, USA. They are well known for their authentic and innovative work. 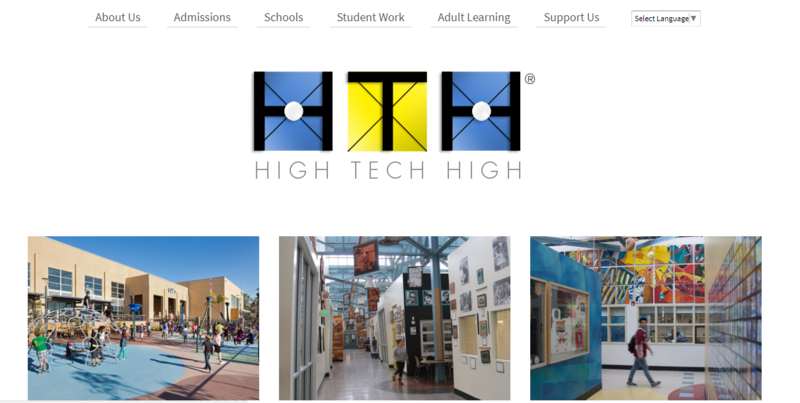 The High Tech High website reflects their modern views on education. A minimalist design makes it intuitive for users to navigate the homepage and find the individual school or information they’re after. A key feature of both the district homepage and individual school pages is the showcasing of student projects. This school is known for their innovative projects and the rich documentation on their websites adds to the user experience. This PK-8 Catholic school in California, USA, has a strong relationship with their community which is reflected in their school website. Striking sliding photography gives a snapshot of the friendly and welcoming school culture. Clear menu headings guide visitors to browse for the information they’re after. Regularly updated news and events makes this website useful for all members of the school community. There are links to sites for families to make further connections, such as the school’s social media accounts and Google Drive folders of student images and work. This unique school is located in Victoria, Australia. It is for Aboriginal girls in years 7-10 from remote and regional Australia. The unique indigenous culture of this school community is reflected in color choices and imagery. Large visual boxes and traditional menu headings are used to direct visitors to explore the website. There are links to connect further with the school community such as through their popular Facebook page. This K-12 independent school in Wales presents a well-maintained and informative website for all members of the school community. Like many of our top choices, high quality photography on a backdrop of school colors really unites both the virtual and physical impressions of the school. Visitors can either use traditional drop down menus to find the information they’re after, or scroll down for a principal’s welcome message and key news. The recent news from different areas of the school is updated regularly with everything from cake stall information to student projects. This is a private secondary school in New York for students with learning challenges. It’s easy to discover the philosophies and values of this school through a prominent mission statement and principal’s welcome. Community members can keep up to date with an integrated blog as well as links to a shared calendar and newsletters. Located in New York, this school district website acts as a hub for individual school websites, similar to the Round Rock example above. This sort of format is easy to set up with CampusPress if you have multiple schools as part of your campus or district. The scrolling photographic display gives a glimpse of daily life within the school district. A regularly updated Twitter feed, school news and calendar makes this a dynamic and useful website for all visitors. The websites of the seven schools this district oversees can easily be accessed through a prominent link at the top of the page. Rural Scotland is home to this prestigious school for students aged 9-18. Strathallan’s website makes a strong first impression. Slogans on the sliding imagery (…welcome to our world) are a clever way to present the culture and philosophy of the school. An impressive promotional video of the school takes center place when scrolling further down the homepage. The overall layout of this site is nicely uncluttered with large text and links invitingly displayed in image boxes. Set in the Himalayan foothills, this Indian international school has a rich history which is showcased in their exceptional website. Breathtaking imagery doesn’t need to be cluttered with excess words. This school sells itself by featuring full width photographs of their stunning location. Beyond the homepage is a well maintained blog with information about school events. The website truly caters for staff, students, parents and alumni with links to resources and private portals. A high quality school website can make a strong first impression for all members of the community. If this post has inspired you to consider giving your own school website an overhaul, you are always welcome to get in touch with our CampusPress team for obligation free advice. Once you have your school website set up you can put strategies in place to ensure it is well maintained and used effectively. Parent education and encouragement is imperative. You might consider avenues you could use to teach parents about how to get the most out of the school website. These could include newsletter articles, open nights or family classroom activities. When visitors are arriving at your virtual front door do they feel welcomed, informed and part of your school community? Don’t miss the chance to nail your first impression. Do you know any great school websites? Perhaps your own school has a fantastic website that is worth showcasing? Please leave us a comment with the details so our community can take a look! Nice looking sites but it would be nicer if these exampled school sites were really accessible. A couple of them have accessibility statements, but deeper examination shows they only added a plugin but didn’t do any of the real work to make them accessible (wcag 2.0 and Section 508) Looks more like a least amount of effort expended to give a illusion of being compliant but not really understanding or caring about people with disabilities, their families and friends and the obstacles of a non-accessible website. Thank you, you make an excellent point. Accessibility is something our company genuinely cares about. While we didn’t have any input in many of these sites, I’ll certainly include accessibility in evaluating sites in any future posts like this. Which plugin was used to create St Johns college website ? http://www.stjohnscollegecardiff.com is built in WordPress using what looks like a custom theme built for the school. I enjoyed being able to not only look at the school websites from your blog, but also from comments. This is a unique way to change and gain new ideas. A google calendar is such an easy thing to use, but I never thought about integrating one on our website for the families to use. We also need to update our photographs. Some of our students have changed much since these pictures were taken. Something that I really enjoy on our school website is that we have an APP connected to it, and on the Elementary part it has a link to our morning announcements. Which our fourth graders are very proud of. So glad to hear you found the examples useful. I certainly enjoyed taking a look at what other schools are doing too. Such a great way to get new ideas! The Google Calendar worked so well when I used it on my class blog. As long as it’s updated properly, parents love being able to check and see what’s happening and it saves unnecessary phone calls or visits for them. Thanks, Josie. Glad you enjoyed it! Good job! This really show’s how WordPress is great! I’m only in the 5th grade. That’s impressive for a 5th grader to build their own website. Well done! How did you do it? I love the way the information on this website is updated so regularly. That would really encourage families to check in regularly.